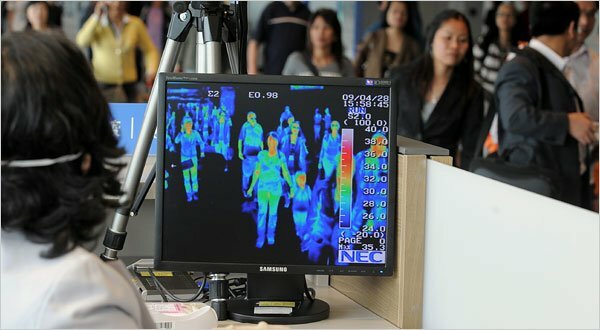 The thermal scanners introduced to screen incoming passengers at China's airports during the 2009 global swine flu pandemic were extremely inaccurate and would have missed almost all of cases of influenza, a new study shows. A review of the effectiveness of airport border screening measures by New Zealand researchers found that thermal imaging devices had only a 3% sensitivity rate for detecting influenza. The study which involved a questionnaire, temperature testing and respiratory tract viral testing found that the rate of influenza was 1.1% overall and 4% among symptomatic passengers. The sensitivity of screening criteria ranged from 84% for “any symptom of influenza” to 3% for a fever of 37.8 °C or greater. The positive predictive value was low for all criteria. "Border screening using self-reported symptoms and temperature testing has limitations for preventing pandemic influenza from entering a country. Using “any symptom” or cough would lead to many uninfected people being investigated, yet some infected people would remain undetected. If more specific criteria such as fever were used, most infected people would enter the country despite screening," they conclude..